Farleys Solicitors has five offices across the North West. It has gained an excellent reputation in providing specialist legal advice to both private and business clients. Farleys Solicitors is a leading law firm with over 180 staff and six offices in the North West. Its departments covering all manner of legal matters, from civil litigation and personal injury, to commercial and environmental Law. Farley’s approached us with the objective of developing a new corporate, SEO friendly website which would define a clear voice for two key target demographics, B2B, and B2C. With our financial web design and marketing expertise, the company was expecting a cutting edge finish. A central request to the project was for the site should be easy to manage and update. As a result, we needed to implement a CMS which allowed us enough flexibility for parts of it to be bespoke, but also be relatively simple for the site admin. When we completed the initial audit of the site, it was important to note that there was a large amount of content to include in the migration. 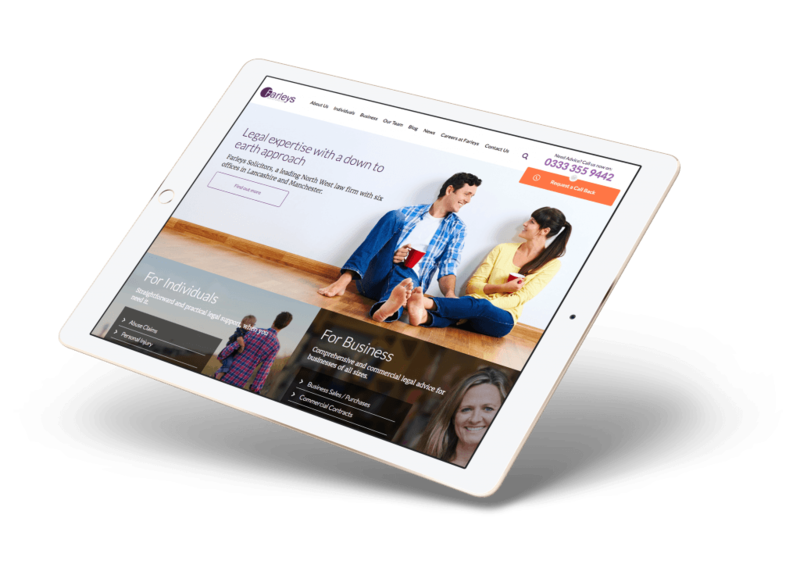 The site our development team produced is a visually rich, engaging website offering a user experience which is second to none. It was built on a fully responsive framework, so that the user experience is consistent across all devices. The CMS offers site admins full flexibility with regards to incorporating social media and streamlining blogs and content, meaning its users can access the most up to date and relevant content to their queries, which in turn will result in not only greater volumes of conversions, but also, highly qualified ‘red hot’ leads. The user interface was designed specifically to increase the conversion rate on the site. Still keeping with the strong purple brand colours, we introduced a secondary green as a call to action colour. The buttons were also designed to emphasise this, with subtle raised edges. With the number of mobile users on the web ever increasing. It was important for the website to be accessible on all devices. The mobile design had to be just as strong as the desktop version. We created a unique angular design, which feels clean and modern. The site also championed employees to appear on various pages, specific to their field of expertise. This gave the site an approachable yet professional quality.